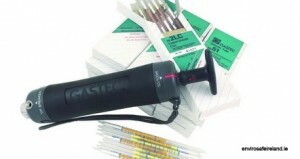 Envirosafe Ireland are the Ireland distributor for supplying gastec gas detector tubes. 99% of our Gastec Gas Detector Tubes can be delivered to your site for the next working day. Gastec Gas Detector Tubes are the most accurate, cost effective, yet simple method of instantaneous gas detection with the capacity to detect over 600 gases, vapours and particulates. Many Draeger tube users are changing to Gastec detector tubes due to the competitive price of the Gastec tubes (typically less than half the price of Draeger tubes) and next day delivery of Gastec tubes. In addition, many users find Gastec easier and quicker to use, as the Gastec pump usually requires only one pump stroke against multiple pump strokes on the Draeger pump. See below training video explaining correct use of Gastec tubes.